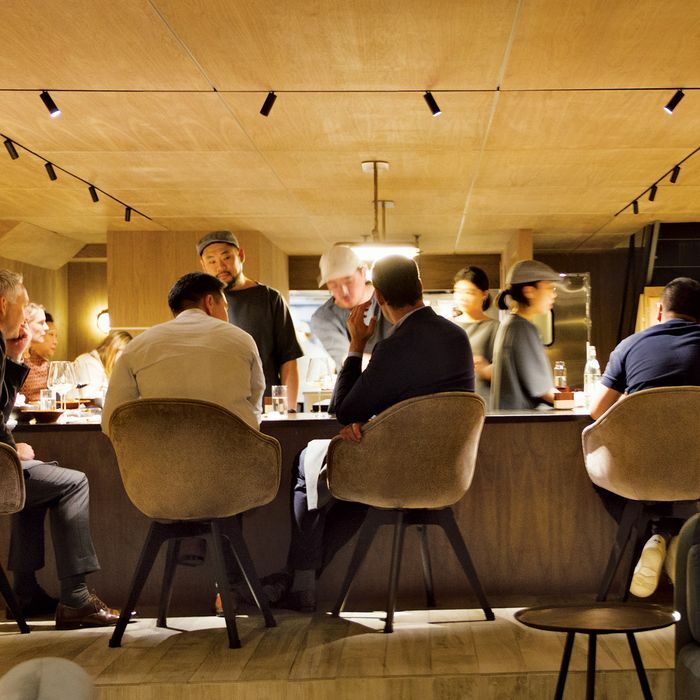 For those weary of the familiar clichés and tropes that have grown up around New York’s great omakase tasting-room boom in recent years, the early, predinner portion of Junghyun Park’s elaborate venture Atomix will bring little relief. There’s the ritual online-reservation experience, which can involve a fair amount of wait time and, inevitably, the plunking down of a sizable, nonrefundable chunk of cash ($175 in this case). There’s the discreetly difficult-to-find entrance, behind a battered black door at the bottom of a slightly dilapidated townhouse on 30th Street in Nomad. There’s the posh little limbo of the bar area, where you’re greeted in hushed tones by the waitstaff, like ushers welcoming congregants into church, before being led in whispering silence to the dining counter, which is arrayed around the kitchen like seats around a tiny stage. “Here we go again,” muttered the grizzled gourmand next to me as the first courses were brought in by a fleet of waitstaff dressed in loose-fitting gray smocks and matching caps that made them look a little like the chorus in an avant-garde Korean play. We were asked to choose a pair of personalized, beautifully decorated chopsticks from a polished wooden tray. 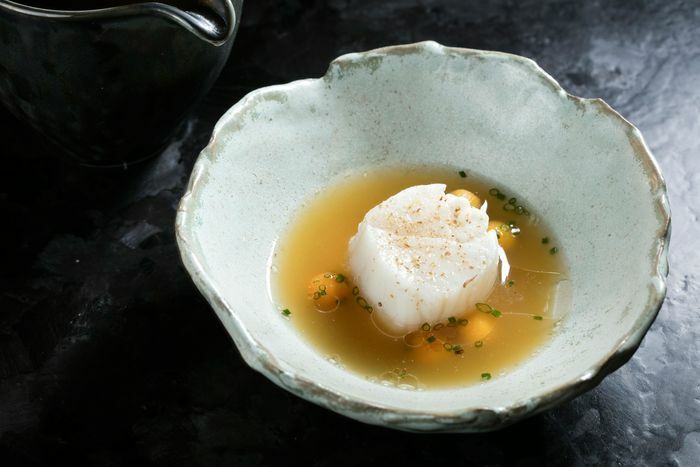 We picked at tiny seafood cakes floating in a soup spiked with different iterations of burdock root, and twirls of sea bream marinated in a rare tangerine vinegar from an island off the southern Korean coast. A single fried langoustine appeared, seized in a salty-sweet crust and garnished with a creamy sauce flavored with nasturtium, uni, and a strange, tingly kind of citrus seed called chopi. My neighbor took a bite, then put down his fancy chopsticks. “Wow, that’s pretty damn good,” he said. Park’s cooking has been eliciting this kind of reaction for some time now — first at the Michelin-approved haute-Korean establishment Jungsik, where he was chef de cuisine for several years, and more recently at his excellent Nomad operation, Atoboy, which was named one of the top ten new restaurants in the city a couple of years back by the grumpy tastemakers of this magazine. Atomix is clearly designed as a lofty, ambitious bookend to the more utilitarian, crowd-pleasing Atoboy, where for around $40 you can enjoy a collection of elevated banchan small plates. Since the opening in late spring, Park has produced only two menus (the fall dinner started just a couple of weeks ago), and every course comes with a card explaining the components of each dish, its place in the canon of Korean cooking, and the particular philosophy behind it. After our ethereal fried langoustine (“That was a shrimp popper of the gods, Platty,” muttered the gourmand under his breath), we were presented with a blizzard of these stylized cards explaining the Korean obsession with “stamina foods” (our stamina food was an intricate little smoked-eel creation accompanied by a poached oyster) and the evolution of dairy dishes as delicacies for the ancient upper classes (expressed in a melting pool of cheese curd topped with golden Osetra caviar). Presently, an entire grilled turbot was brought in for our inspection, later to reappear deboned in soft, white shreds touched with a darkly rich seafood sauce flavored with chrysanthemum. After that came several candy-size blocks of charcoal-grilled Wagyu that were so sweet and tender (they’d been cured in various fruit juices for 36 hours, the card said) I’m still dreaming about them two months later. The word seems to be out about Atomix among regulars on the city’s high-roller omakase circuit, and on the evenings I visited, the seats were filled mostly with jovial hedge-fund operatives knocking back goblets of grand-cru wines from the impressive house list (I counted 32 Champagnes). At the end of dinner, the decorative menu cards are gathered in a folding paper box and presented for safekeeping, sealed in a silvery plastic bag. If you don’t have the patience (or the cash) for this kind of ceremony, you can always drop in to the bar upstairs, which is open to non-omakase riffraff off the street and serves a small à la carte menu until closing time. The drinks I sampled were subtle and well structured (try the soju-based Three Kingdoms and the house martini, infused with angelica root), and the rice-stuffed fried chicken wings are so good you might want to order them twice. 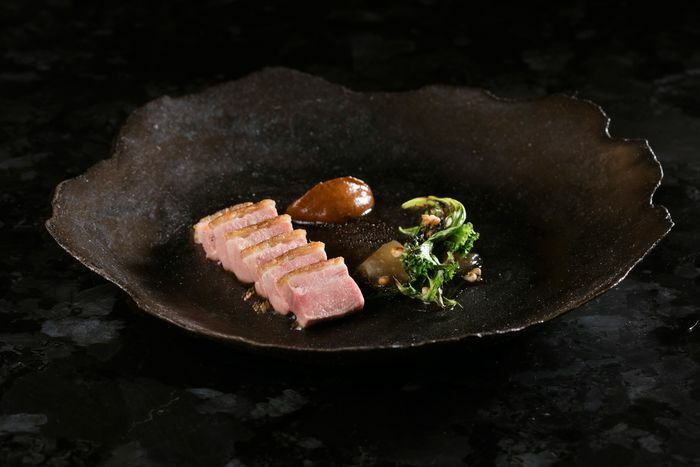 Ideal Meal: The summer menu was a little more dynamic than the new fall offering, but pay attention to the Wagyu with sea cucumber, the halibut-and-foie-gras jjim, and the roast duck with gochujang mole. Note: The counter seats 14, and there are two seatings per night, at 6 and 9 p.m.
Scratchpad: One star for inventiveness, one for technique, and one for good old-fashioned pleasure.